The Department of Labor’s new overtime rule significantly increases the number of people who qualify for time-and-a-half pay for any hours they work beyond 40 in a week. Under the old version of the rule, far too many salaried workers were not covered by overtime protections because the salary threshold of $23,660 per year had not kept up with wage growth or inflation and was therefore far too low. Under the new rule, salaried employees making less than $47,476 a year must be paid overtime. 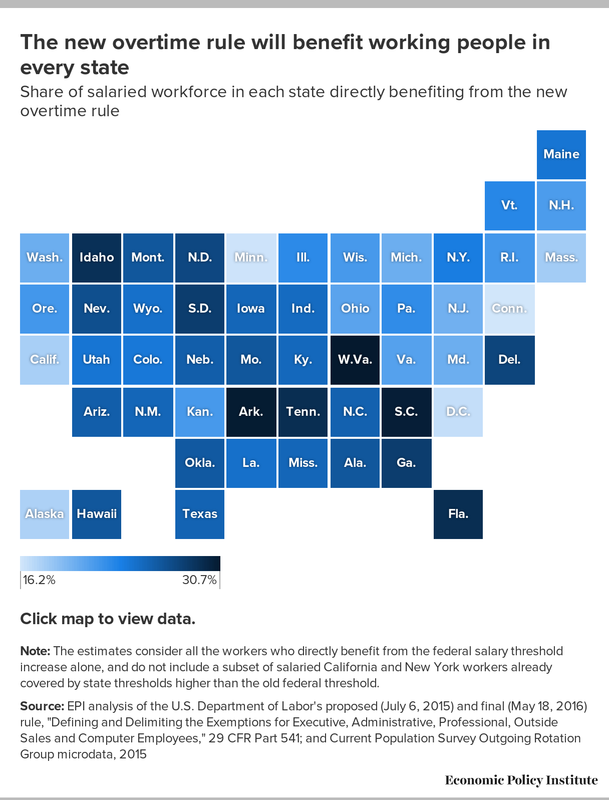 Note: The estimates consider all the workers who directly benefit from the federal salary threshold increase alone, and do not include a subset of salaried California and New York workers already covered by state thresholds higher than the old federal threshold. This new rule will benefit working people in every state. In South Carolina, for example, 30.3 percent of the salaried workforce—219,000 people—will directly benefit from the new rule, bringing the total share of the salaried workforce covered under the new threshold to 39.9 percent. In Texas, over one million people will directly benefit—25.4 percent of the state’s salaried workforce. Nationwide, 12.5 million people (or 23.3 percent of salaried workers) will benefit, whether from time-and-a-half pay for any hours worked over 40 in a week, having their hours scaled back to 40 hours a week while still taking home the same pay, or getting a raise to put them above the threshold. Additionally, more than 100,000 people will benefit by getting a job doing the work that overworked people used to do for free.